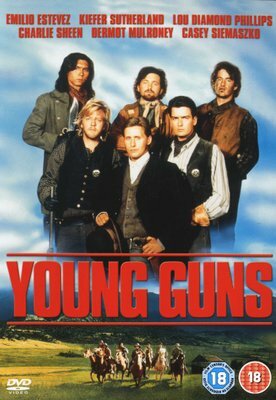 1878 New Mexico: Billy the Kid and five young outcasts are hired by British cattleman John Tunstall in an attempt to educate them and prepare them for a life in the wild Nebraska territory. But when their boss is brutally murdered by a gang working for corrupt rival cattleman L.G. Murphy, all hell breaks out as they create chaos in an attempt to avenge the death of their friend and benefactor. The Young Guns are branded outlaws and become the object of the largest manhunt in frontier history, now riding against incredible odds.